Installing central air conditioning in any facility is not as easy as just finding a contractor that fits a budget. For a contract price, you could be getting a cheap, large but inefficient AC unit fit for a large home up North, or it could be a mid-sized, highly efficient, top quality model suitable for a small home in more temperate climates. Quality, performance, efficiency, and size are the four top factors to consider, most would advise. There is a fifth factor that is worth considering, and that is brand. Here, we will take a closer look at the Day and Night brand and hopefully provide helpful information in anybody’s central air conditioning decisions. Day and Night air conditioners are regarded to be mid-range cooling units popular among medium enterprises or medium-to-large residential facilities that look for value over price. Day and Night might not be as “famous” as some of its competitors, but Day and Night is considered as being among the Top 3 air conditioning brands by HVAC professionals, up to par with the manufacturers of Amana and Mitsubishi cooling systems. Day and Night cooling products have been widely rated as reliable with top-notch customer service. 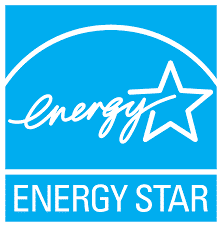 Day and Night air conditioners are Energy Star qualified. Energy Star qualified air conditioning systems are at least 10% more energy efficient than the minimum federal standards. Day and Night Air Conditioners offer a range of models that are highly-competitive in the HVAC market, ranging from 13 SEER to 19 SEER ratings. 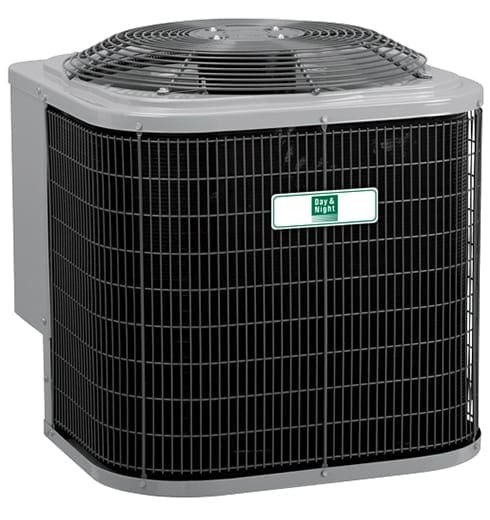 SEER, or the Seasonal Energy Efficiency Ratio, measures the ratio between an air conditioner’s cooling capacity to its power input. The higher the rating, the more efficient the air conditioner is. Or, in other words, the higher the SEER value, the more output you are getting out of your equipment for the same cost of energy. On the other hand, the lower the SEER rating, the lower the production. Day and Night is owned by United Technologies -- the same parent company that is home to Carrier Air Conditioning. Although they are completely different brands, they carry several of the same quality-control procedures. A closer inspection of Day and Night and Carrier’s internal mechanisms will reveal them to be very similar, too. United Technologies also manufactures Bryant and Payne. As with any service or product provider, Day and Night has its fair share of negative reviews. Day and Night seems to have average reviews online, but a number of HVAC professionals have attributed this to substandard installation and not directly on unit quality. And since Day and Night is considered to be one of the “lesser-known” companies relative to the big players in the air conditioning market, Day and Night simply does not have the marketing power to overcome the negative reviews. A common denominator among all negative reviews on Day and Night is the Warranty terms that are offered with their units. 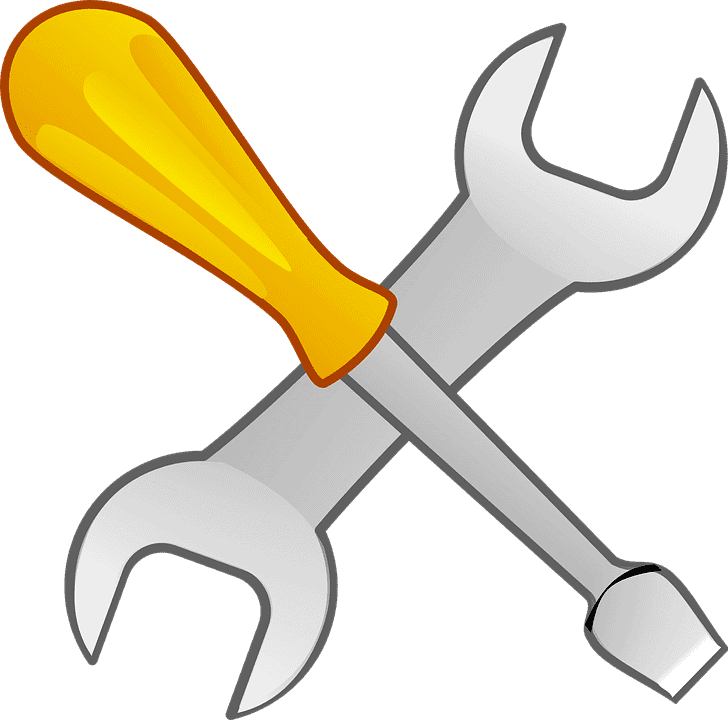 Day and Night warranties may run up to ten years, but it covers only the parts and not labor. Some users have also raised concerns over the difficulty to find parts for Day and Night units. One of the more observable (i.e., not subjective) downsides to Day and Night cooling systems, however, is availability. The brand is not available across the entire U.S.A. to date, perhaps explaining, too, why it is not as “famous” as its counterparts. The Day and Night Constant Comfort™ Deluxe Series is the brand’s premier line, engineered to be the quietest, most efficient cooling series, giving optimum home comfort levels. This series provides superior summer dehumidification for added comfort during warm weather. The models in this series come equipped with two-stage operation with up to SEER 19 ratings, guaranteeing long-lasting, energy-saving performance. A two-stage operation air conditioner with a sound decibel as low as 56, this model is Day and Night’s quietest, most advanced air conditioner. The SmartSense variable-speed technology adjusts to even the smallest changes in climate to ensure optimum comfort and savings. It comes covered with a 10-Year No Hassle Replacement™ Limited Warranty. A two-stage operation air conditioner with a decibel level as low as 70, this high-efficiency model gives you better temperature and humidity control. This model has Wi-Fi® enabled remote access when paired with the Observer® communicating wall control. It comes covered with a 10-Year No Hassle Replacement™ Limited Warranty. The Day and Night Constant Comfort™ Series is rated as the brand’s reliable and efficient cooling models that deliver consistent, relaxing home comfort. The models in this series are compact-sized, with up to SEER 16 ratings. This series features enhanced sound-reduction and summer dehumidification functions. 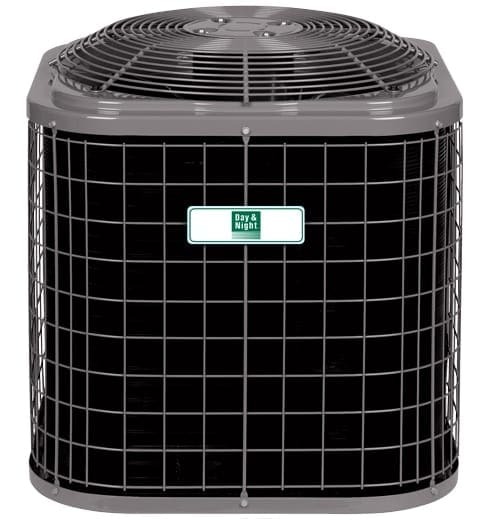 This high-efficiency model has a SEER 16 rating and delivers ultra-quiet comfort with decibels a low as 69. This model has Wi-Fi® enabled remote access when paired with the Observer® communicating wall control. It is covered with a 5-Year No Hassle Replacement™ Limited Warranty. 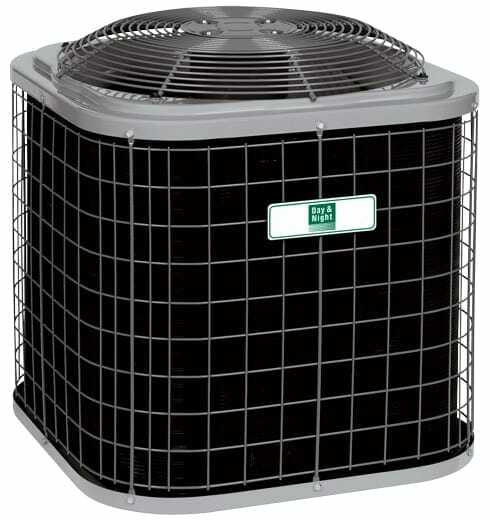 This economical model has a SEER 15 rating and gives you quiet cooling comfort with decibels as low as 74. This model has Wi-Fi® enabled remote access when paired with the Observer® communicating wall control. It is covered by a 1-Year No Hassle Replacement™ Limited Warranty. 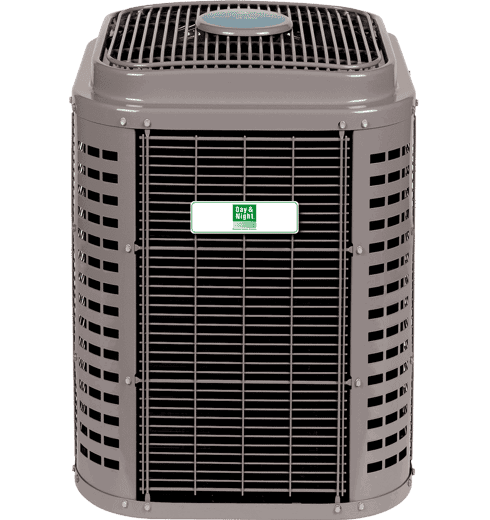 A budget-friendly efficient air conditioner, this model has a SEER 13 rating. It’s compact and sturdy design withstands the elements and will reliably deliver cooling comfort for a long time. It comes covered with a 1-Year No Hassle Replacement™ Limited Warranty. The Day and Night Performance Series is the economical set that sets a premium on your home’s comfort and cooling efficiency. It has up to SEER 16 ratings. Coastal units are likewise available. This single-stage operating model delivers quiet performance at as low as 70 decibels. Its guaranteed durability allows it to withstand bad weather and debris. It comes covered with 10-year Parts Limited Warranty. This single-stage operating model delivers quiet performance at as low as 76 decibels. It is built to last with a durability that allows it to withstand bad weather and debris, with a resistance to corrosion. It comes covered with 10-year Parts Limited Warranty. This model keeps things peaceful with quiet cooling performance at as low as 66 decibels. 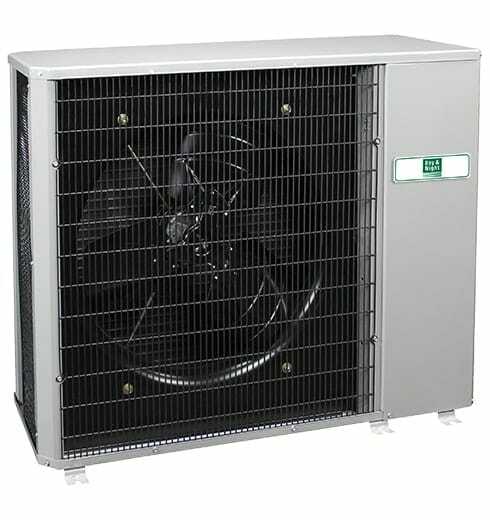 This compact, single-stage operation central air conditioner is suitable for multi-family housing. Its stackable design has an efficient "pass through" airflow feature. Built to last, it is fitted with a weather-resistant cabinet and a tight wire protective guard. It comes covered with 10-year Parts Limited Warranty. This SEER 14 single-stage operating model delivers quiet performance with as low as 75 decibels. It is built to last with a durability allows it to withstand bad weather and debris, with a resistance to corrosion. It is covered by10-year Parts Limited Warranty. Day and Night air conditioners appear to be targeted to the middle of the market as a standard-quality brand with a moderate cost. The estimated durability of 15-18 years is in the same range as virtually any modern system from any maker. Day and Night air conditioner outdoor units (or what is referred to as the ‘condensing unit’) may cost around $1,300 to $3,500. 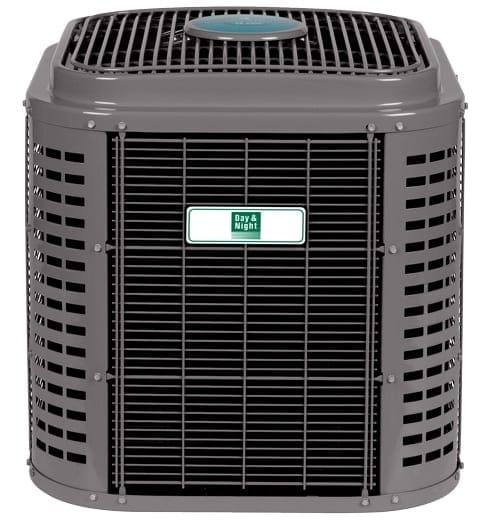 Basic air conditioner installation costs may range from $1,200 to $2,000, still excluding extras like condensing unit pads, refrigerant linesets, evaporator coils, and thermostats. Roughly, a contractor quoting you a total project price of $5,300 is giving you a “steal”… you had better look elsewhere. Anything between $5,800 and $6,100 may still be too low and you run the risk of ending up with a low-quality AC unit. A quote of $6,300 is still considered low, but fair. A fair project quote is somewhere around $6,800 to $7,100 and this is more typical. Anything above $7,700 is too high and, again, you had better look elsewhere. This is a very rough guide, though, and it can vary depending on season and where you’re located. It is worth mentioning again that one has to be more discerning about hiring a contractor to do the air conditioning installation. For a quoted contract price, you could be getting a cheap, large but inefficient unit best for a large home up North, or you could be getting a mid-sized, highly efficient, top quality model suitable for a small home in warmer regions. A good rule of thumb to follow is that top brands will be selective about who they allow to install their products. The major HVAC players will never let sub-standard installation compromise the actual quality of the brand’s models. Quality, performance, efficiency, and size of an air conditioning system remain to be top on your list of considerations, though the right contractor is just as important. Day and Night is a heating and cooling systems brand manufactured by International Comfort Products Corp., a subsidiary of United Technologies Corporation. Day and Night has its roots as a solar water heater provider in Monrovia, California way back in 1909. Day and Night ventured into space heating come the 1930’s. In 1997, the brand was retired from the industry but was resurrected in the Western U.S. and Canada in 2009 under United Technologies Corporation’s management. UTC is a multinational conglomerate based in Connecticut, U.S.A. that researches, develops, and manufactures various building systems and industrial products – from aircraft engines and aerospace systems to HVAC, elevators, and escalators among others. UTC Climate, Controls & Security is the umbrella under which Day and Night falls, along with global HVAC brand Carrier, among others. Considering Day and Night for your HVAC requirements? Typical user complaints of unit failure are, more often than not, attributable to improper installation and sub-par service technicians. It pays to remember: Any HVAC acquisition, maintenance, improvements, etc. is a sound investment. Finding quality service and installation providers is every bit as critical as picking out the best equipment for your facilities. This completes the circle of protecting any investment. AC Problems: Repair or Replace?